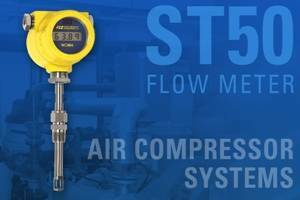 Engineers who need to reduce the energy cost of air compressor systems will find the precision ST50 Air Flow Meter from Fluid Components International (FCI) helps them more accurately measure compressed air and detect system inefficiencies or expensive leaks. Plants that depend on point-of-use compressors will find the ST50 Flow Meter is a cost effective mass flow monitoring solution that is ideal for compressed air flow measurement. It provides precision flow measurement to reduce the consumption of pneumatic air, helping manufacturing, assembly and process plants reduce air consumables and the energy required to support compressed air systems. The installation of ST50 Flow Meters in large facilities with multiple air compressors allows the operators to compare compressor usage and adjust them for optimum efficiencies. In addition, the use of mass flow meters at the point of compressed air output helps to ensure peak performance at a given flow rate. Comparing the performance of multiple air compressors is also useful in predictive maintenance applications where higher flow rates may indicate leaking valves or seals in one unit versus other units operating under similar conditions. The ST50 Flow Meter utilizes FCI’s highly accurate thermal dispersion mass flow sensing technology to provide highly effective direct mass flow measurement at a lower cost. With the ST50, there is no need for the temperature sensors, flow computers or other devices required with orifice plates, Venturis, Vortex shedding and other meters. The ST50’s unique design also provides built-in temperature compensation for reliable measurement over a wide temperature range with almost no pressure-drop. The ST50 Flow Meter features a wide flow range from 0.23 to 122 NMPS for air, compressed air or nitrogen. Flow meter accuracy is +1% of reading, +0.5% of full scale, with repeatability of +0.5% of reading. The meter operates at temperatures from 4 to 38°C. The ST50’s flow range can be field-configured in either standard mass flow or volumetric engineering units. In features dual analogue outputs, 4-20 mA and 0-10 Vdc, which are field assignable as flow rate or temperature and an RS232C I/O port. A 0-1kHz pulse output for totalising flow is also available as an option. All configurations are easily user set in the field with any standard laptop to the RS232C port and/or via the wireless IR link/PDA. The ST50, featuring a rugged stainless steel sensing element with Hastelloy-C tips, is designed for endurance and maximum performance in outdoor and field installation conditions. Its electronics are housed in an all-aluminium, epoxy-coated enclosure that is NEMA 4X (IP66) rated and it withstands operational pressures up to 34 bar (g). Three process connections are available for the new ST50 high-accuracy flow meter: 1/2-inch MNPT or 3/4-inch MNPT with a stainless steel or Teflon ferrule. It is available in three field adjustable U-length probes, 152, 305, and 457mm to accommodate pipe sizes 51 to 610mm. Instrument powering options include both DC (18-36V) and AC (85-265V). The ST50 comes with a 1-year standard warranty. The versatile ST50 offers the best value in its class, featuring superior performance, low maintenance, ease of installation and a long-life. Whether adding flow measurement to improve the process or replacing high-maintenance flow meters, the ST50 provides an accurate, fast response and no-maintenance solution for compressed air, gas and nitrogen flow measurement. For smaller line sizes under 51 mm, FCI’s ST75 air/gas flow meter is an ideal choice. To ensure optimum accuracy, performance and quality, FCI owns and operates a best-in-class test and NIST traceable calibration laboratory. FCI product developments are subject to rigorous testing and calibration integrity validation using high-speed data acquisition systems and precision flow calibration equipment.